Drip, or trickle, irrigation is becoming a popular irrigation method for both commercial and residential use. Unlike surface irrigation methods, drip irrigation focuses on slowly providing water to the roots of the plants. The control drip irrigation gives you make it one of the best irrigation techniques available today. A drip irrigation system uses a network of drip emitters that slowly feed water to a specific area. The Drip emitters are connected to a main feeder hose that will provide a slow and steady flow of water. 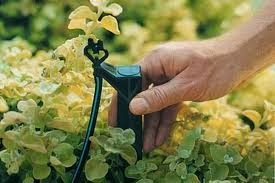 The drip emitters run alongside the plants and the water is fed to the base of the plant, keeping the upper foliage dry. Besides keeping the upper plant dry and less susceptible to fungi, drip irrigation is also a much more economical method of irrigation than other techniques. With sprinklers, water is distributed over a large area and is not precise. A lot of water is wasted due to the running off of excess water. Drip irrigation targets specific spots and the soil slowly absorbs the water it needs to help the plants grow. Drip irrigation is a great irrigation method for large farmers and home owners. Whether you manage huge plots of land or a small garden in your backyard, drip irrigation will help you be more successful.